Who really killed Mughniyah - was it only the Mossad? 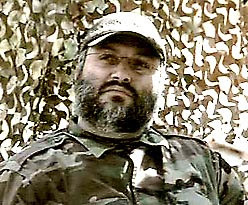 Imad Mughniyah, a top Hezbollah leader, has been killed in a car bomb yesterday in Damascus. Hezbollah immediately blamed Israel for the assassination. If this is indeed an Israeli operation, and that appears most likely, that is a huge success for Israel who as long considered Mughniyah The epitome of the 'Axis of Evil' and who has blamed numerous terrorists acts on him, including the bombings in Argentina. 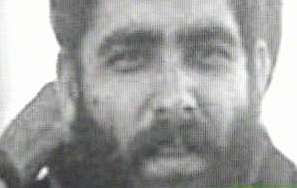 Even though this specific accusation is demonstratively false, Mughniyah was also accused by the US and Israel of being involved in the 1983 and 1984 bombing of US and French barracks in Beirut, the hijacking of TWA Flight 847 and the kidnappings of Westerners (all of which occurred before the creation of Hezbollah in 1985). Originally a member of Fatah' Force 17, Mughniyah has also been accused of being a member, or at least a collaborator, of many other organizations including even Al-Qaeda (this most exotic theory was proposed by Michel Ledeen). Considering all the propaganda and demonization which the Empire always subjects all its enemies to, it is hard to find out which, if any, of those accusations are true (though Ledeen's theory is so laughable to be self-evidently false). What is certain is that Mughniyah is a symbol of the early period of Hezbollah, possibly one of the co-founders of the movement and that Mughniyah was held in high esteem not only in Hezbollah, but also among other Lebanse Shia movements. What is equally certain is that having turned Mughniyah into an arch-villain the Israelis have scored a huge PR success in finally killing him. After all the recent SNAFUs, killing Mughniyah will do much to restore the bruised egos of the Israelis. But how much will this affect Hezbollah itself? It is hard to answer this question because so little is known about Mughniyah's real role in the organization. We know two things: that Mughniyah was a senior member and that he was a highly skilled person. It is therefore reasonable to suppose that his murder will have a significant impact on the movement, at least in the short term. 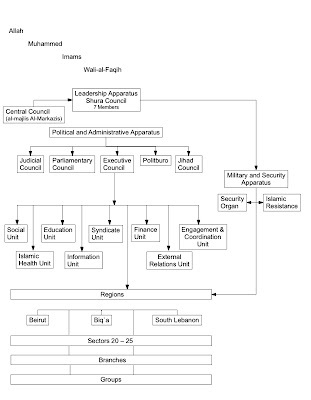 It is, however, absolutely essential to remember that Hezbollah has a highly complex and decentralized organizational structure with no single center of power, much less so any "key leader" position (click on the picture for a larger image) and that Mughniyah assassination will have very little impact on the organization itself. But what about the morale of its members or the message this sends to its leaders? Will they understand that Israel's message is "behave, or else..." (as a Haaretz commentator seems to think)? ((Of the believers are men who are true to the covenant which they made with Allah: so of them is he who accomplished his vow, and of them is he who yet waits, and they have not changed in the least)) Almighty Allah has spoken the truth. With pride and honor, we announce the martyrdom of a great resistance leader who joined the procession of Islamic Resistance martyrs. After a life full of Jihad, sacrifices and accomplishments lived with a longing to martyrdom, Islamic Resistance leader Hajj Imad Moghniyeh (Hajj Radwan) was assassinated by Israeli criminal hands. The martyr, may his soul rest in peace, had been a target for the Zionists for more than 20 years. Almighty Allah has chosen him to be a martyr on the hands of His Prophet's killers who know that we have a long battle with them and the blood of martyrs especially our leaders has always taken our resistance to a higher and stronger level, just like when our two great leaders, Sheikh Ragheb Harb and Sayyed Abbas Moussawi were martyred. We pledge to continue the martyr's path until achieving complete victory, God willing. We offer our sincere condolences to the martyr's family and his brothers in arms and we congratulate all resistance fighters for the Divine legion of honor. Not only is martyrdom is at the very core of the Shia's ethos, it is also a spiritual reality which was built in Hezbollah's culture from its very foundation. The killing of a senior Hezbollah leader, while always an organization nuisance and a personal tragedy, is always considered as an immense spiritual victory for Hezbollah, it is an event which inspires, emboldens and re-energizes the pious Shia. This might seem incredible or bizarre for somebody educated in the West, but for somebody raised in a religion centered around the concept of martyrdom this is actually rather obvious. This leaves on unresolved question: how was it possible for the Israelis to successfully plant a car bomb in Damascus, in a brand new neighborhood, in the immediate proximity of several Syrian intelligence buildings and kill a presumable highly protected target. Setting aside all the silly mystique about the "super-skilled Mossad" (which has way more pathetic SNAFUs to its credit than real successes), anyone with a working understanding of what such an operation would entail can immediately see that Mughniyah murder could not have been possible without Syrian complicity, if not more. The only question left open is how high in the Syrian government the accomplices of Israel are. A rogue operation of some isolated elements of the Syrian Mukhabarat is just not something very credible and it is reasonable to assume that the Assad regime was a crucial accomplice in this operation. Is this really surprising? For all the talk about Syria being a 'state sponsoring terrorism' the Assad regime has been more than willing to provide 'torture services' for the CIA, so why assume that this policy of 'collaboration in the war on terror' would be limited to torturing people? It will be most interesting to see how this situation will develop, but if indeed Syria is behind the murder of Mughniyah this is a declaration of war on Hezbollah and, possibly, Iran. "February 13, 2008 -- Bush's strangest Syrian bedfellow: At center of suspicion in Hezbollah leader's car bombing: The head of Syrian military intelligence, Assef Shawkat, is no stranger to working with the CIA. Syria has, since 9/11, served as a host for the torture of "extraordinarily renditioned" prisoners captured by the CIA. Shawkat has been at the center of the CIA's program. WMR has learned from reliable sources that the car bombing in Damascus of Hezbollah military commander Imad Mugniyah on February 12 was carried out by Shawkat with the active encouragement and support of Deputy National Security Adviser Elliott Abrams and Israel's Mossad. WMR has reported in the past that Abrams is the coordinator within the Bush White House of political assassinations, particularly those in the Middle East, and specifically, similar car bombing assassinations in Lebanon. WMR has also previously reported that many of the car bombings in Lebanon were the result of coordination between Israeli, American, and Syrian operatives, including "rogue" Syrians and Lebanese agents in the employ of Shawkat. Mugniyah was wanted by the United States and Israel for a number of terrorist attacks in the 1980s and 1990s, including the 1983 bombings of the US Embassy and Marine Barracks in Beirut, the 1985 hijacking of an Athens-to-Rome TWA flight in which Navy diver Robert Stethem was murdered, and the kidnapping and murder of Beirut CIA station chief William Buckley in 1984 and Marine Corps Lt. Col. William Higgins in 1988. Significantly, the Israeli Prime Minister's office has denied any role in Mugniyah's assassination. However, Israeli government and intelligence officials are happy that it occurred. Mugniyah's car exploded at around 10:30 pm in the up-market Tantheem Kafer Souseh neighborhood of Damascus. WMR has learned that the car bombing of Mugniyah was to be timed with the February 9th birthday of President Ronald Reagan, a gesture by Shawkat to the Americans, but the specially designed Mitsubishi seats containing the bombs were installed late, resulting in the February 12 assassination. In the Middle East, dates, particularly anniversaries, carry much weight. 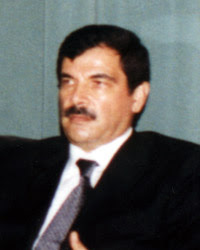 The assassination of Lebanese Member of Parliament Elie Hobeika on January 24th 2002, coincided with the birthday of Elliott Abrams, the then-National Security Council Middle East director. Hobeika's car bombing assassination in Beirut was also carried out by Shawkat's operatives, according to WMR's Middle East sources. The Hobeika assassination was the first in a series carried out by the CIA and Mossad with the assistance of Shawkat's intelligence operatives in Lebanon. Shawkat, by delivering the goods on the assassination of America's "Most Wanted" Mugniyah, has ensured that he will now receive the protection of the Bush White House in the current UN investigation of car bombings in Lebanon, most notably that of former Lebanese Prime Minister Rafik Hariri."